To most, John F. Kennedy is one of the most beloved American Presidents to ever reside in the White House. Although shrouded by tragedy, JFK's legacy is one that borders on legendary. Kennedy is one of the few Presidents whose place in pop culture history goes beyond his time in office. Released in the wake his death, 1964 Topps John F. Kennedy trading cards capture the icon on both a professional and personal level. The 1964 Topps John F. Kennedy set has 77 cards. The design, typical for the era, is very simple. Card fronts have a large black and white photo surrounded by a thin white border. There are no captions. Card backs are horizontal. They are dominated by an illustration of Capital Hill. Surrounded by a starry border, the backs also have a short caption describing the photo on the front. 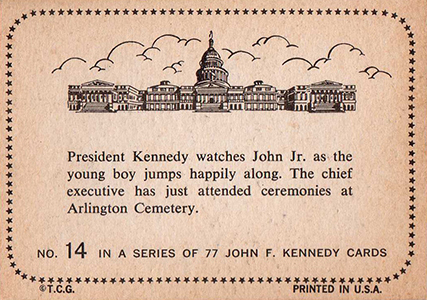 While many of the 1964 Topps John F. Kennedy cards capture the President in action, what makes it stand out is the personal side it also shows. Many cards show JFK, the family man, hanging out with his wife, Jackie, and young children, Caroline and John Jr. Other cards look at the Kennedy family as well as important political figures of the time. 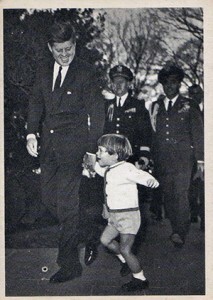 They also feature Kennedy before he moved into the White House, both in the military and as a Senator. 1964 Topps John F. Kennedy trading cards remain relatively inexpensive. Although not scarce, they're not as readily available as many other trading card sets from the era. Rosan released a similar JFK trading card set a short time before Topps. These cards have nearly an identical design, particularly in regards to the black and white fronts. The copyright info for both sets is different. Topps cards read, "T.C.G." while the Rosan set states, "Rosan." The Rosan set also has three illustrations at the bottom of the card to go with the caption versus Topps' Capitol Hill drawing. Lot of 7 ORIGINAL vintage 1964 TOPPS John F Kennedy JFK Trading Cards! Lot of 6 ORIGINAL vintage 1964 TOPPS John F Kennedy JFK Trading Cards! 63 Mrs. Kennedy poses with her son, John Jr.
65 President with Carolin and John Jr. I have these set of cards and will like to sell them give me a price or where can I sell them….help. thank you so much. good luck in helping me. I have almost the full set in good condition, no creases have been kept in plastic – only missing #’s are 2,6,9,10, 18, 25, 33, 36, 53,58, 61, 63, 65 & 77. I have doubles in 4, 19,23, 39,42, 57, 62, 64, 66, & 74 and triples in 29, 35, & 67. The prices for these JFK cards confuse me. How can a card on one page be $2.99 and the same card on the next page be $750.00. I have the whole set and plenty of doubles. Found in a shoebox, untouched for 50 years. I have a set of 77 JFK cards missing 7, 11, 16, 22, 33, 46,48, 56 and 70. I would like to sell the set if possible. Anyone know where I can sell. Kept in plastic and in good condition. if i have some cards how i cant know is real or not ? Got a set of JFK assassnation cards. Wondering what they are worth? 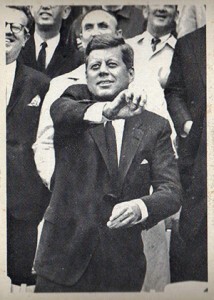 I have a complete set of John F. Kennedy cards that I would like to sell. Would you be intrested in them?